My son and I like to go the movies and do so at least once a month if not more. It was a fun movie but I suspect that by the time he’s ten, he’ll be too embarrassed to be seen in public watching a Dr. Seuss movie. I have never been a huge fan of Dr. Seuss, finding it a bit silly, but I will say that this movie made me feel differently as it led my son to ask some questions on the way home making me regret the small fortune that a movie costs nowadays at least a little bit less. One of the themes of the story, for those of you who do not already know, is that the land of Whoville exists on a speck of dust clinging to a clover and only Horton knows they are there. Horton, with an unquestioning sense of responsibility, holds the clover in his trunk and protects it fervently from all harm. 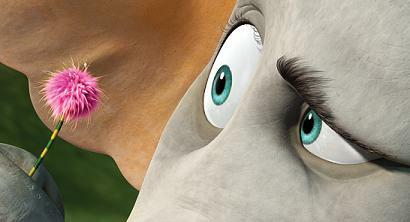 The problems arise because nobody in Horton’s world believes in Whoville and nobody in Whoville believes in Horton. As odd as this may sound, the story begs the question about ourselves, our planet, our solar system, our universe and our God and my son picked up on all of this with the active imagination of a nine year old. I won’t start to describe all of the parallels but they are in there. Needless to say, my son’s fascination with these unanswerable questions gave us a great opportunity to talk and for me to articulate what I truly believe. Behind all of the rhymes, there really is genius in this story. This entry was posted on March 30, 2008 at 1:36 am and is filed under Family. You can follow any responses to this entry through the RSS 2.0 feed. You can leave a response, or trackback from your own site. o.k. I loved that movie! It was one of the best movies ever. I love you dad!!!!!!!!!!!!!!!! !